Blanch the broccoli in a large saucepan of boiling water then remove with a slotted spoon and plunge into iced water. Drain and set aside. Blanch the beans in the same saucepan then remove from the pan and plunge into iced water. Drain and set aside with the broccoli. Heat a non-stick frying pan over medium-high heat and spray with oil spray. Cook the bacon for 3-4 minutes or until golden and crisp. Remove and drain on paper towel. Wipe the pan out then return to the heat and toast the almonds for 1-2 minutes or until golden. To make the dressing, place the buttermilk, mayonnaise, garlic, chives, salt and pepper in a bowl and whisk until well combined. 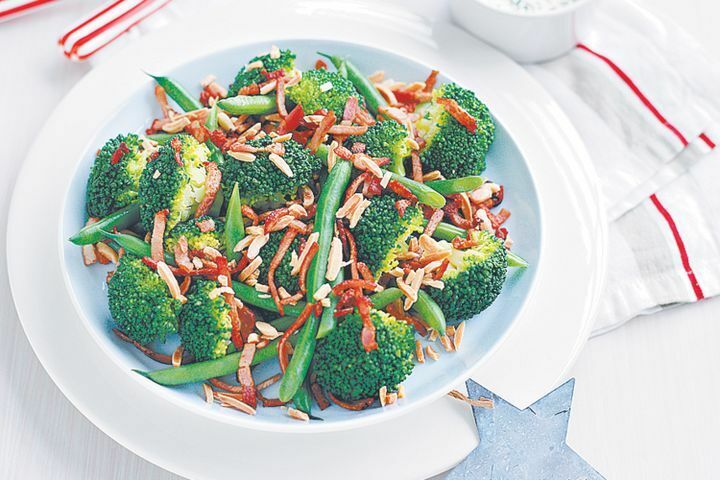 To serve, place the broccoli, beans, bacon and almonds in a serving bowl and toss gently to combine. Drizzle with the dressing and serve.